Power Within Reach: Macro keys are useful but only if they're easily accessible. The Mech5 gaming keyboard was design with that in mind. The modular D-Pad can be adjusted to perfectly complement your hands natural gaming position. Stop wasting time reaching for Macro keys all the way across the keyboard! Improve Your Game: Our simplistic design approach improves your speed and accuracy by keeping just 5 Macro keys to the immediate left and 6 additional ones (D-Pad) directly above your hand -- all at your fingertips. Too many Macro keys lumped up together in the same place or split to all corners of the keyboard will only bring additional confusion and stress! Unrestricted Modular Customization: Attach the Numeric Keypad on the left-wing of the Mech5 and instantly add 17 additional Macro keys to your arsenal. Attach it to the right-wing and use it as a standard numeric keypad or leave it detached to make more room for your mice. 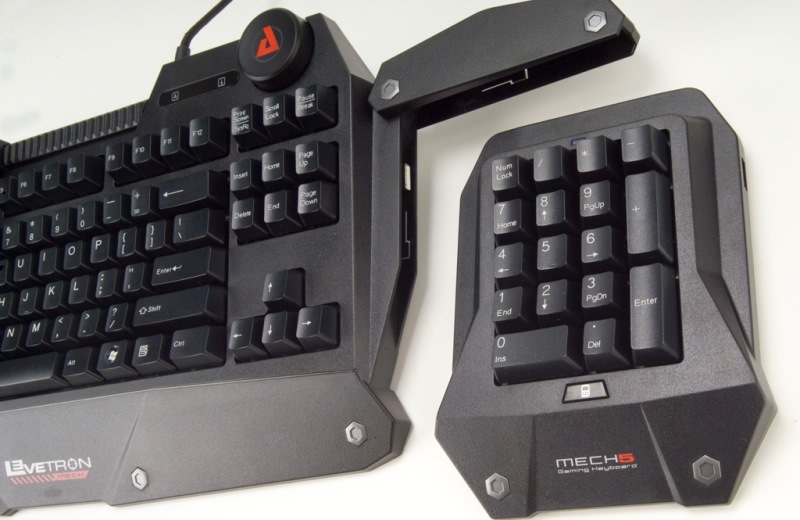 Virtually all keys across the Mech5 are user programmable! Built for War: This ultra-durable keyboard is designed for heavy combat. The Cherry mechanical switch extends its lifespan to 50 million keystrokes. In addition, this keyboard is designed to be water resistant, featuring special seals and drainage gutters. Spilling your drink on your keyboard is no longer an excuse for losing! Mechanical Keys: The Cherry Black mechanical switch is widely believed to provide the best gaming experience. Featuring a linear design ideal for rapid pressing of keys and the right stiffness to help prevent accidental key presses. Fully Programmable Keys: The included Software allows for full customization of the entire keyboard and 11 dedicated Macro-keys. Modular Design: The numeric keypad can be attached to either side of the keyboard or remain detached. The included Macro Keypad module is the first of many accessories that will take advantage of the keyboard's rail system. Macro D-Pad: The add-on Macro D-Pad expansion allows for 6 additional programmable keys. The expansion module rail enables custom positioning by sliding the D-Pad left or right. Anti-Ghost: Ensures multiple commonly pressed keys register when pressed simultaneously. Water-Resistant: Engineered to remain functional even if accidentally exposed to liquid. Do not flip or shake the keyboard and the liquid will properly drain itself. 2x USB Expansion Ports: Connect your USB devices directly to the keyboard for added convenience. Braided Cables & Gold-Plated USB Connector: Enhanced durability and conductivity.